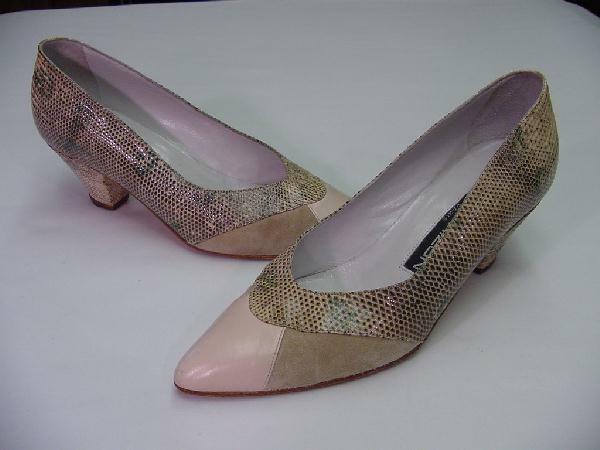 These leather and lizard pumps have a pinkish beige leather that goes from the center to the pointed toe. There is gray-tan suede at an angle on each side of the vamps, and the rest of the shoe is lizard skin in cream to dark brown with accents of grass green. The modified Cuban heel has lizard wrapped entirely around it. There is a scuff mark on the upper tip of the left shoe, and another on the suede outside section on the left shoe. 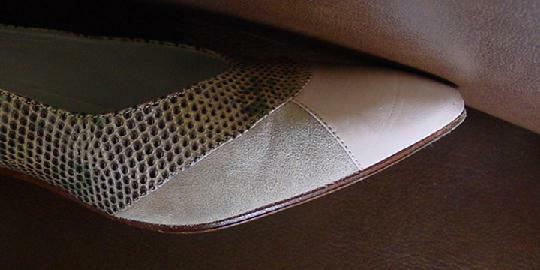 There are heel guards on the outer edges. Maud's shoes are beautifully designed and always flattering to your feet. Her craftsmanship and materials are amazing. These very striking looking shoes were made in Italy and are from a stylist's collection.